Five bold Girl Scouts—Makenna, Amelia, Julianna, Micaela, and Sofia—demonstrated the power and voices of a 100-woman army. How? This small but mighty group took on a complex and meaningful challenge to earn their Girl Scout Silver Award. 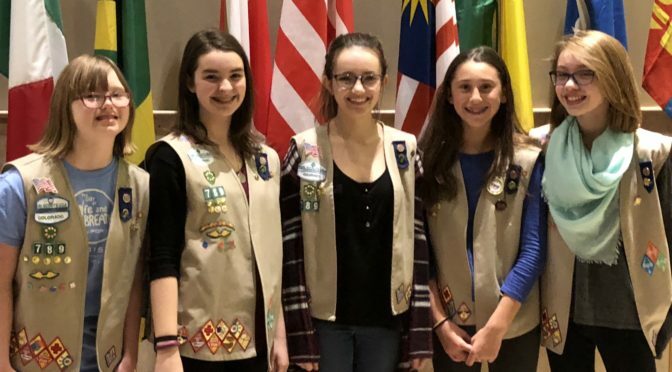 As part of Troop 60789 from Girl Scouts of Colorado, the girls worked closely with their longtime troop leader Kristen Batcho and other community mentors for almost a year to champion and pass an ordinance that made smoking (whether tobacco, marijuana, or vaping) in a vehicle while a minor is present subject to community service or a fine. The ban, passed by the Aurora City Council, is the first of its kind in Colorado and an incredible accomplishment for these determined change-makers who are just 13 and 14 years old. Amelia, Makenna, Micaela, Julianna, and Sofia present their smoking ordinance to the Aurora City Council on September 25, 2017. Before starting their Silver Award project, the girls completed the Breathe Journey, part of the Girl Scout Leadership Experience, focusing on how the environment, air, and noise pollution all affect people. After completing the Journey, the girls discussed what they would do with all of the new information they had just learned and then brainstormed how they could apply it to their Silver Award project. During these discussions, they kept coming back to the topic of smoking, mainly the many different ways that it harms adults and children—smokers and nonsmokers alike. The girls researched the topic further and decided to try to ban smoking in cars with minors to minimize the effects of secondhand smoke and to protect young people’s health. “We wanted to give a voice to the kids who don’t have a voice to tell the adult person to stop smoking,” said Makenna, age 13. To begin creating this important change in their community, Kristen and the girls reached out to Aurora City Council member Charlie Richardson for guidance. He was 100 percent on board! Charlie attended one of the troop’s meetings and educated the girls on the ordinance process. He then connected them to city attorney Nancy Rogers, who helped them write the actual ordinance in the most effective way possible. Nancy also came to a troop meeting and engaged in a lively discussion with the girls during which they asked questions and talked through how they wanted the ordinance to proceed. Initially the girls wanted to make smoking in a vehicle with minors a primary offense. In other words, a police officer could pull someone over for that without any other reason. But when the original ordinance came back with an amendment to make it a secondary offense, meaning a person would have to be pulled over for another offense first before they could be punished for smoking in a car with a minor, the girls realized they had a better chance of getting the legislation passed if they accepted the amendment, so they did. When it came time for the ordinance to be discussed in detail at a city council meeting, the girls asked several speakers to testify on their behalf, including representatives from the American Lung Association, the American Cancer Society, UCHealth, and National Jewish Health. Kathleen Moreira, the representative from UCHealth and a tobacco treatment specialist and smoking cessation expert, gave what Kristen calls “quite a compelling testimony” on secondhand smoke and the effects it has kids, especially as they’re still growing. Because Kathleen is a former smoker, the child of a parent who smoked in the car often, a mom, and a proud Girl Scout alum, UCHealth felt she would be the perfect person to represent the hospital and support the girls in their pursuit. Kathleen Moreira, Kristen Batcho, and Girl Scouts Makenna and Julianna smile for the camera after being interviewed by 9News morning anchor Cory Rose about the girls’ Silver Award project. Sophia, Amelia, Micaela, Makena and Julianna are recognized by Senator Rhoda Fields at the State Capitol for their efforts and work passing the smoking ordinance. And it’s not just secondhand smoke that Kathleen is worried about. Thirdhand smoke is also dangerous, especially for babies and toddlers. What is thirdhand smoke? It originates from the particles of a burning cigarette that are left on surfaces, for example, the chemicals and nicotine that stay behind on doors, windows, and everywhere else in a vehicle when someone smokes inside it. This means that even when children aren’t in a car at the time someone is smoking, they can still ingest all those chemicals later on as they touch different parts of the vehicle. Kathleen revealed that when children are chronically exposed to nicotine and smoke, their chances of becoming a smoker greatly increase. By passing the ordinance, the girls and city council members are helping prevent 2,200 kids in Colorado from becoming daily smokers, she further explained. Even with all of the support the girls were able to garner, they also encountered some negativity and opposition. After their first meeting with the city council, a few not-so-nice comments cropped up on social media and in the form of other complaints. Because of this, Kristen and her co-leader, Michele Malchow, were concerned about having the girls attend the final council meeting in which a final vote for or against the ordinance would be made. “We had been trying to keep the experience positive for the girls,” Kristen said. “But when we talked to them about it, they said, ‘This is part of life, and we have to deal with it.’” Kristen was impressed with the girls’ maturity and courage and decided to let them attend the meeting; they would leave only if things got too heated. “What I have learned throughout this process is that everyone has an opinion on everything and not everyone will agree with what you’re trying to achieve, but that’s OK,” Makenna said. Can you imagine what Troop 60789 will be able to accomplish in the years to come? Congratulations, girls, on a job extraordinarily done! Previous PostTroop 60632’s S’mores success storyNext PostConnections: Have you seen our new camp offerings?